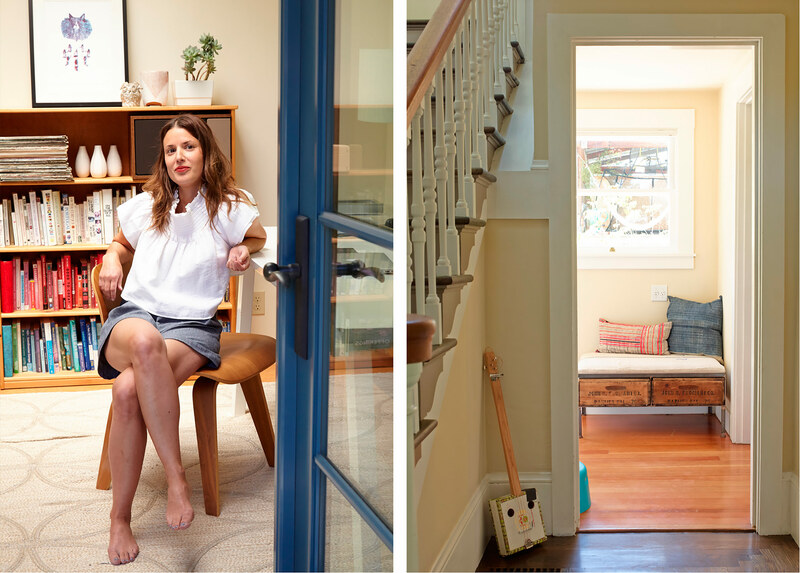 For Bay Area brand consultant Rachel Wolff, each day is a new project, a new job, a new opportunity. Continually juggling multiple projects, Wolff’s work centers around helping emerging businesses identify and execute strategies to expand and thrive. It’s been a roundabout trajectory — Rachel started her career in healthcare fundraising and outreach, “I imagined myself doing policy work but somehow my emotional sensitivities got the best of me fast,” she explains. “I burned out quickly.” From there, she gained experience in the creative, analytical side of retail, working for Banana Republic and various large brands while starting a life in New York City. A few years ago, she moved with her family to her childhood home in Northern California, and in turn branched out on her own career-wise, founding a consulting company where she could take a more personal approach to developing business strategies for emerging brands. Today, her days are unpredictable, but life is full in all the best ways. Can you share more about the current projects you’re working on — what’s on the front burner? I am always juggling one too many projects; I have a hard time saying no. I love people, and I get really excited about projects and brands – right now my focus in my work is simplicity. I have great work right now, and I feel really passionate about my current projects. I am finally not solely focused on New York, and have great projects here in California. My main focus is a growing women’s start-up in San Francisco called Cuyana, whose mission and simplicity really speak to me. For someone new to your work, can you describe the nature of your consulting work — what’s a typical project for you? One thing about my work is that there really isn’t a “typical.” I guess that is what keeps me motivated. Each brand is different, from the needs to the team to the business. In a nutshell, I drive product strategy. My role is to grow a business by focusing on the core and the product. Often brands grow quickly, or get pushed and swayed by wholesalers or showrooms – it is so hard for talented, creative people to find the time to build a strategy and implement it. My role spans from design to sourcing to sales strategy to often times HR. It’s my job to help identify what to assort and why and then to ensure we hit our targets. It’s always a little unnerving, but it is pretty amazing to be at a place in my career where I have made enough mistakes and grown enough brands that I really know what to do and how to make an impact. I can say that I truly love my work and while it is often filled with tactical Excel spreadsheets, it is super rewarding to see a business grow. Do you — or have you ever — struggled to define your work? I feel like after 15 years of doing this work I only just now know what I am good at. I stumbled along for years always looking at what I didn’t have—for example an MBA (which is pretty common in my field). Only just recently I have embraced my consulting career and [feel like I can] finally speak about it coherently! The beauty of working with many brands is that it really is always different, so when someone asks me, “What do you do?” I often have a different answer. I am finally embracing my unique work life. Can you share more about what you like about working with emerging brands versus larger corporations? Impact vs. Politics: I like working directly with the source. At the heart of it, there is something really rewarding about helping a small brand grow — there are times that personal finances are involved for founders and one season can make or break things — this is where the strategy really counts. In the corporate world I ran on adrenaline and fear. Today, with my consulting I really love what I do and I work just as hard but have so much more impact. I feel so much more proud of my work. It is no longer about fear, it’s about feeling like I am making a contribution in the world and I guess that is full circle to my initial dreams of making a political impact in the world in a roundabout way. I often wish I had the courage earlier in life to follow my passions and focus on my life, but whatever the timing I am so grateful I moved into consulting. "It is no longer about fear, it’s about feeling like I am making a contribution in the world and I guess that is full circle to my initial dreams of making a political impact in the world in a roundabout way." What’s a dream project for you? I am a lover of fashion and all things beautiful, so there are so many amazing brands and designers I would love to work with. But if I really hone in on what a dream project will look like for me next, it is creating something of my own. I have spent my career behind the scenes editing and changing and tweaking and supporting; there is a part of me that feels open to the challenge of making something and putting it out there. The ideas are still forming. How has being a mother changed the way you work? I give everything 1000% now. It’s crazy. I have less time and somehow that means I really feel like I can’t settle. I get a little obsessed with my projects: I have always been that way, but since having my kids I find I am faster, more clear, and more able to assess and fix things quickly. I guess there is so little time, and having kids makes you realize how important everything and everyone is. "I guess there is so little time, and having kids makes you realize how important everything and everyone is." At the risk of using the (overused) word “balance”…how do you find your own? I have two kids and everyday is made of choices. As a mom I have to choose wisely or I will fall apart. To keep it together for me I juggle a trifecta of: personal time, time with friends (super important to me), and downtime with my family. The personal time is always the one I sacrifice. I cherish this time in my life so much and my kids bring me so much joy that I kind of just embrace the craziness and know that later in life I will get back to that solo time that really fills you up. What are five pieces that are essential to your daily wardrobe? 1. A blouse that works with everything. 2. The right jacket – both structured and soft. 3. High-waisted jeans 4. Jewelry – my new Metier bracelet is my current love. 5. A chunky heel. What are constants in your beauty routine? What are five things you’re currently really interested in? 1. Tequila. I’m so into it right now. 2. Saturday morning hikes. I’ve been getting up early on Saturdays and sneaking off to the nearby Redwood trails with a few girlfriends. It’s one hour: we walk and talk and it is always inspiring and doesn’t cut into my weekends with my kids. 3. Marie Kondo‘s decluttering. I am working on it. 4. Vintage jewelry and discovering family heirlooms 5. Random record collecting. We have been collecting old records with our son and we come up with some crazy playlists. Coffee in bed snuggled up both kids and Tim. It’s the best. We also spend so much time outside: It really fills me up. I am addicted to fresh air lately — I used to reach for coffee in the afternoons, but lately I really crave fresh air and being outdoors.